Over a decade ago, Hasbro launched a collection that turned the vehicles and characters of Star Wars into giant transforming robots. As you do. The line came to an end in 2012, but now it’s back in a suitably grand style, kicking off with the fastest-transforming hunk of junk in the galaxy. Behold, the new Transformers Millennium Falcon. 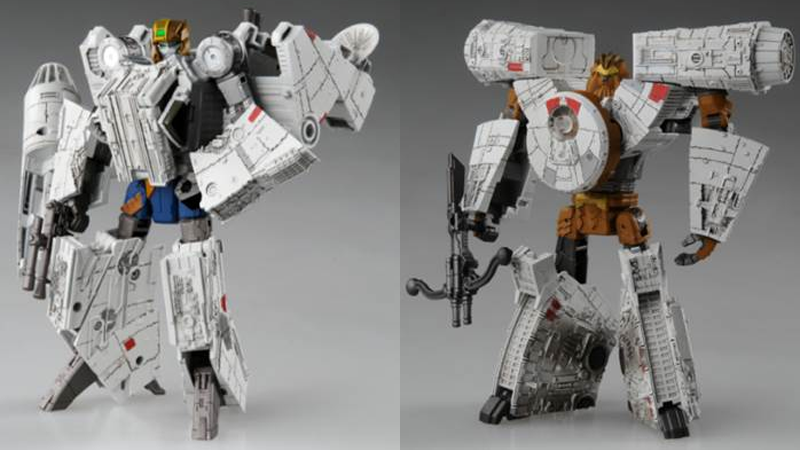 New images from retailer Big Bad Toy Store have revealed a first look at Tomy’s new version of a Transformers Millennium Falcon, which, like the first version released back in 2007, splits into two combiner robots (is a Star Wars Transformer still a robot, or is it a droid?) of Han Solo and Chewbacca. Han forms the front part of the Falcon, while Chewie forms the engines. Both of the mechs have their own weapons, and the set even comes with two little figures of Han and Chewie for good measure. While it’s very similar to the original version, the new Falcon is less comically proportioned when combined into the vehicle mode, and could pass for what is otherwise a pretty decent looking Millennium Falcon model. It just so happens to, you know, turn into two giant robots. That’s like, the best extra feature any model of any vehicle could possibly have! There are no details on the scale of the new Transformers Falcon, or if it even comes with light and sound effects like the original version did, but one big difference for the new model is its price: It’ll set you back a whopping $135 when it releases in June this year. But if Star Wars toys have taught us anything, it’s that we should grab them as fast as we can. Update: An earlier version of this story said the older collection was a collaboration between Hasbro and Tomy, but it was a Hasbro-only venture. io9 regrets the error.